Hooray! I got paid today! This is my first paycheck in about five months so although most will go to my bills, I have a little extra to splurge. I bought a few polishes(of course), and also went to the mall with DH and LO to take advantage of the B&BW semi-annual sale to get some candles and hand soaps. I also stopped at Ulta and found a lemming on sale that I'll show you in this post. Later, I met up with some friends for Korean BBQ so they could meet LO and had a great time showing her off. Overall, it was a fantastic day! I've tried Layla Cosmetic holos before and love their application and unique colors, but this is my first time using one of their Ceramic Effects polishes and I hope that they stay true to my previous experience. 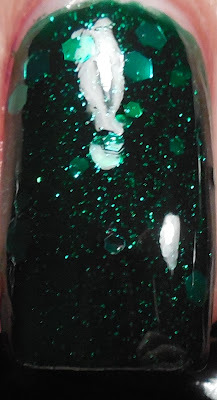 Luckily, Green Galaxy did not disappoint me with it's stunning shade of green jelly and green multisized glitters. I used two layer over Illamasqua Rampage, a green jelly, so that it wouldn't diminish the jelly-ness of the Layla but I think I probably could have used two coats of Green Galaxy on its own and gotten the same result because it was fairly opaque. I had no trouble with the glitter clumping but it did dry a little rough so it benefited from a layer of Poshe topcoat. Green Galaxy didn't really play as well as I'd like with the fast drying topcoat so you may see a little bit of shrinkage. Greens are my favorite and I adore this color combination. I compared this to Hare's Supernova Springs and found that the Hare's was lacking in the larger hex glitters but similar otherwise. I adore the larger hexes in the Layla so it's enough justification to keep both(in the mind of a polishaholic of course). I wish you lots of success and a great 2013!